Despite reaching an agreement on trade with the U.S., South Korea hasn’t seen any relief from Section 232 investigations. One may be the loneliest number, but 232 is the number keeping South Koreans up at night. After renegotiating the Korea-U.S. free trade agreement (KORUS FTA), South Korea thought it had put the tensions in the economic relationship behind it. That hasn’t turned out to be the case. Despite the renegotiation of the KORUS FTA, South Korea finds itself caught in the middle of the Trump administration’s use of Section 232 national security investigations on trade. Prior to the Trump administration, the United States had conducted only 14 Section 232 investigations and none since 2001. All but one of those investigations took place in the 1980s and 1990s. However, in a little more than a year and a half in office, the Trump administration has concluded Section 232 investigations into imports of steel and aluminum, while also initiating investigations into imports of automobiles and automotive parts, as well as uranium. The use of Section 232 national security investigations appeals to the Trump administration because they provide leeway to impose tariffs on other countries despite years of tariff reductions through the WTO and FTAs, while governments have wide latitude in deciding what impairs national security under international trade rules. Without using national security exemptions as a loophole, the Trump administration would be more limited in its ability to use tariffs to pressure U.S. trading partners. This tactic, however, complicates South Korea’s trade with the United States. Two of the four investigations to date are directly related to some of South Korea’s most significant exports – steel and the automotive sector – and the Trump administration has yet to signal that it will exempt U.S. FTA partners from the findings. In 2017 South Korea exported 3.4 million metric tons of steel to the U.S., making it the third largest source of imported steel in the United States. In order to avoid 25 percent tariffs on steel exports to the United States, Seoul agreed to limit its exports to 70 percent of its average exports over the last three years. This effectively places a cap of 2.68 million metric tons a year on South Korea’s steel exports to the United States. The impact, however, on South Korea’s steel industry goes beyond the United States. South Korea’s overall exports of steel have declined as other major importers, such as the European Union, have put in place quotas or initiated anti-dumping investigations to prevent protectionist measures in the United States from flooding their markets with excess steel. As a result, South Korean steel exports were down 9.4 percent from May to June and 9 percent from the prior year. The talks earlier this year to renegotiate the KORUS FTA largely focused on changes to the automotive provisions, including increasing exemptions for U.S. vehicles from South Korean safety standards. Trump himself referred to the results of the renegotiation as “A great deal for American and Korean workers,” but should the administration determine that automotive imports are a national security risk and not grant South Korea an exemption it could also unravel the renegotiated KORUS FTA. The conclusion of the investigation on automotive imports could come soon. On July 19, the U.S. Department of Commerce held a public hearing on the Section 232 investigation into whether imports of automobiles and automotive parts harm U.S. national security and could conclude the investigation as soon as the end of this month. Automotive exports to the United States accounted for nearly 30 percent of all South Korean exports to the United States in 2017, and 32 percent of South Korea’s total automotive related exports. If the Department of Commerce determines that imports of automobiles and automotive parts impair U.S. national security, reports indicate that the Trump administration is considering a 25 percent tariff. 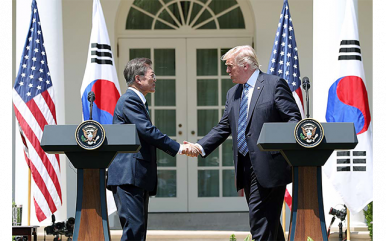 An adverse Section 232 decision would have a more significant impact on the South Korean automotive industry than if the Trump administration had simply withdrawn from the KORUS FTA, as it threatened to do last fall. Rather than the 2.5 percent tariff that South Korean automobiles would have faced from an end to the KORUS FTA, they would now face a tariff 10 times higher. Steel and automobiles are not the only Section 232 investigations that are of concern to South Korea, as there are suggestions that more could be on the way. The most problematic for South Korea would be an investigation into imports of semiconductors. According to the Semiconductor Industry Association, semiconductor sales topped $400 billion in 2017 and have continued to show strong growth in 2018. South Korean producers are among the world’s leaders. In 2017, Samsung passed Intel to become the world’s number one semiconductor producer. Along with SK Hynix, the world’s third largest semiconductor manufacturer, the two account for more than 20 percent of the world’s semiconductors by revenue, but they are especially dominant in the area of memory chips, where the two companies account for almost 70 percent of DRAM and around 50 percent of NAND chip sales. The majority of semiconductors are consumed in China, where many of the world’s consumer goods are produced, but a Section 232 investigation into semiconductors would add one more challenge to an industry that already faces falling prices and potentially reduced demand from the Trump administration’s tariffs on Chinese exports to the United States. This could be especially problematic for Samsung, where chip sales accounted for 79 percent of its operating profit in the second quarter. Despite having been the first country to reach an agreement on trade with the Trump administration, there has been little indication that it has brought South Korea any relief from Section 232 investigations. If the Trump administration does not change course and grant South Korea an exemption, key industries in its industrial economy could find themselves under increasing U.S. pressure. Troy Stangarone is the Senior Director for Congressional Affairs and Trade at the Korea Economic Institute of America. The views expressed here are the author’s alone. U.S. pressure on Seoul over trade issues undercuts the need for cooperation on North Korea policy.